Prime Minister Benjamin Netanyahu approved Sunday the construction of two sections of fence on the Israel- Egypt border, one near Rafah in the north and one near Eilat in the south, at the cost of NIS 1-1.5 billion ($0.27-0.4 billion). The relatively low-tech barrier will include radars to detect human movement, which will help prevent infiltration into Israeli territory. Netanyahu was quoted as saying that the whole of Israel would be surrounded by a fence eventually. During discussions in the Prime Minister's Office, two possibilities were presented for securing the border. One was proposed by the IDF and estimated to cost NIS 1.5 billion and the other was proposed by the National Roads Company and estimated at NIS 2.2 billion. Minister of Interior Eli Yishai, Foreign Minister Avigdor Lieberman, Internal Security Minister Yitzhak Aharonovitch, Justice Minister Yaakov Ne'eman, Defense Minister Ehud Barak and other security figures participated in the discussions, at the end of which the prime minister decided to adopt the IDF proposal. Netanyahu has spoken recently about the need to solve the problem of border infiltrations, which has been continuing for years. Proposals have been submitted in the past, including ideas for physical barriers such as fences, but were not implemented – mostly for budgetary reasons. According to police estimates, some 100-200 illegal aliens infiltrate into Israel each week through the border with Egypt. Some of them come as labor immigrants, while the rest are defined as "criminal elements" and refugees from Africa. Interior Minister Yishai emphasized the urgency of the problem, noting that the refugees constitute a "social time bomb," particularly in the light of the social conditions in some Israeli towns such as Tel Aviv, Arad and Eilat which have absorbed many refugees. The problem is compounded by the criminal problem of human trafficking. 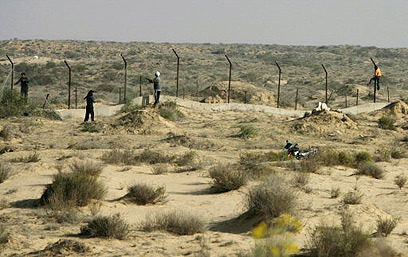 In a previous discussion at the Prime Minister's Office, Internal Security Minister Aharonovitch proposed that a regular, low-cost fence be built on the border, in order to create a preliminary obstacle to hinder infiltration. The minister was also asked to sponsor a law that would allow harsher sentencing for anyone assisting infiltrators. The proposed bill, which increases sentencing from two years to at least three, plus fines, is now in the first stages of the legislation process. Netanyahu noted that the problem required system-wide attention, and further discussions are expected. In addition to the legal steps taken and the physical barrier planned, Israel is also cooperating with Egypt regarding the infiltration, though the decision reached during former PM Ehud Olmert's term of office has not yet been implemented. According to this decision, infiltrators were to be returned immediately to Egypt. Residents and heads of regional councils on the border with Egypt welcomed the decision on Sunday. Ramat Negev Regional Council head Shmulik Rifman said, "This is a brave and life-saving decision, which will give security to the residents of the South." He added, "I hope the decision is really implemented. Unfortunately such decisions are often met with budgetary problems." Eshkol Regional Council head Haim Yalin also welcomed the decision, saying, "For a very long period of time the council suffered from the entrance of infiltrators and refugees, who end up startling the defense forces and the residents. For us, any refugee is a potential terrorist." Some 200km southwards, Eilat Mayor Meir Yitzhak Halevy said, "From the day I entered office I pushed the defense minister to create a barrier on the western border, with emphasis on the southern section that is some 14km long. "In January, 2007, after the nefarious terror attack in Eilat, I was assured that they were getting started and building the fence. Since then there has been no progress in the matter. We stepped up pressure due to the intolerable infiltration of African citizens into Israel, and I am glad the fence is back on the prime minister's agenda." See all talkbacks "Netanyahu approves construction of Egypt-Israel border fence"